Pasta shapes are quite the controversial topic in our family. Like I said, it is very controversial. My parents also have a dedicated space for pasta, and I recently raided their stash in search of a box of mini penne. Love mini penne. Also in hand, was a jar of my dad’s famous pesto. His sauce is perfectly green, with a hint of parsley and it’s not too garlicky. He also uses walnuts instead of pignoli. 1.) Cutting the asparagus exactly the same size as the pasta. I’ve noticed that when I mix pasta with other sized ingredients, I end up with either a forkful of just pasta, or a forkful of the other stuff. What I want, is a nice medley of both. In this recipe, the asparagus is tailored to size so that you can eat with ease. It really makes a difference. I like mini penne with pesto because of the little lines or ridges in them, which is great for catching the sauce. 2.) Having the right ratio of pasta to asparagus. Mine is 3/4 lb : 1 lb. Usually, I will make the full 1 lb. box to feed 4 people, but it’s too much pasta and not enough vegetable. So, I remove some and save it for soup. 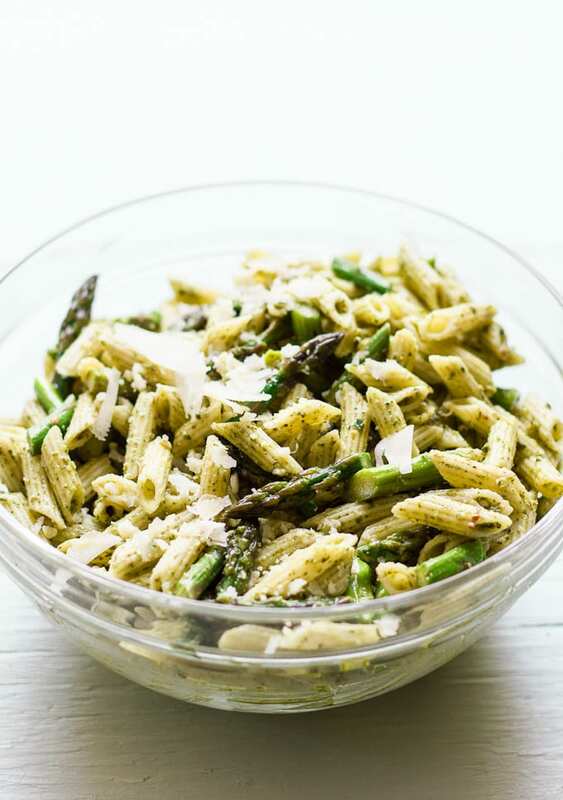 This way, you get both pasta and asparagus in every bite. Success! My dad’s pesto needs no adornment other than a sprinkle of cheese and possibly a chilled glass of wine to serve. The only exception this time was a dash of crushed red chili flakes for a spicy kick. You can do this with any pesto sauce- mine, yours, or store-bought. So tell me, are you as crazy as we are about pasta shapes?! If you can’t find mini penne, regular penne will work or any other short cut pasta. Save about 1 cup of the starchy pasta water to help loosen your sauce. Stir well, about 1-2 minutes for a silky texture. I do this for all of my pasta sauces. Only cook the asparagus until crisp-tender, about 2-3 minutes. Any longer and it will lose its bright green color as it will continue to cook once removed from the pan. Cook the pasta according to the package instructions. 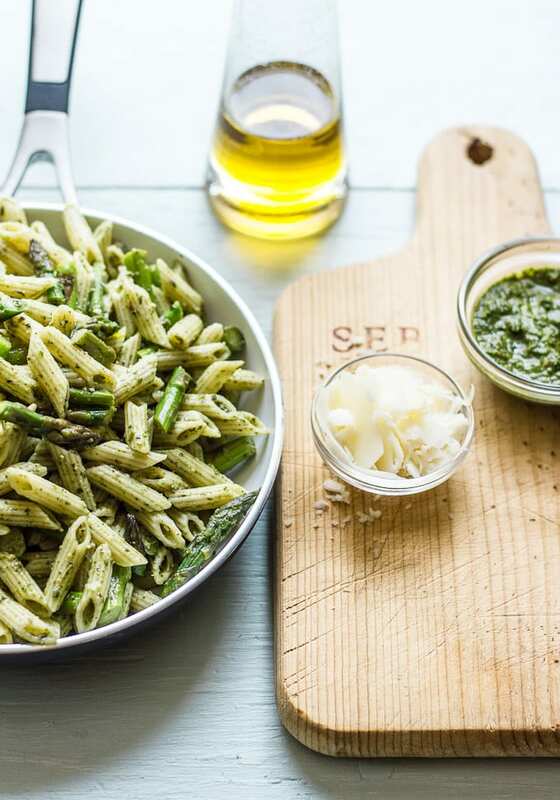 Save about 1 cup of the starchy cooking liquid to loosen your pesto sauce. Drain and set aside until ready to use. 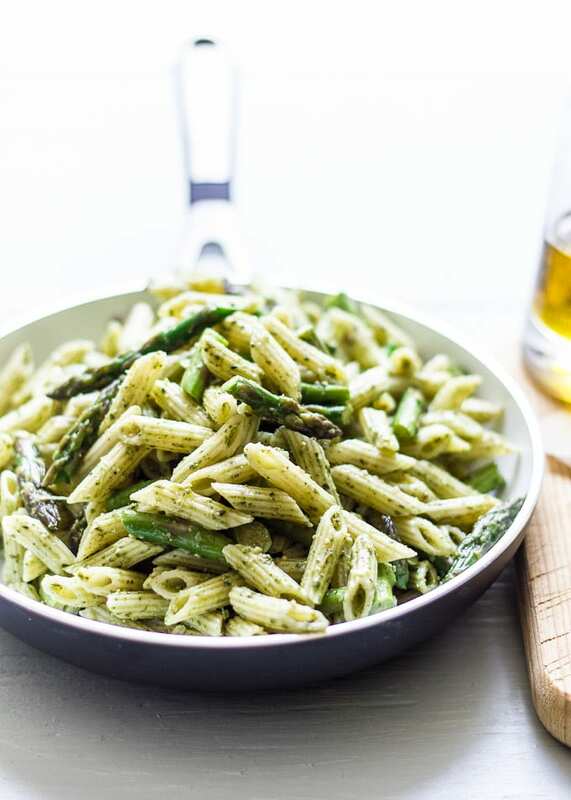 While the pasta is cooking, prepare your asparagus. Trim off the dry, woody ends and discard. 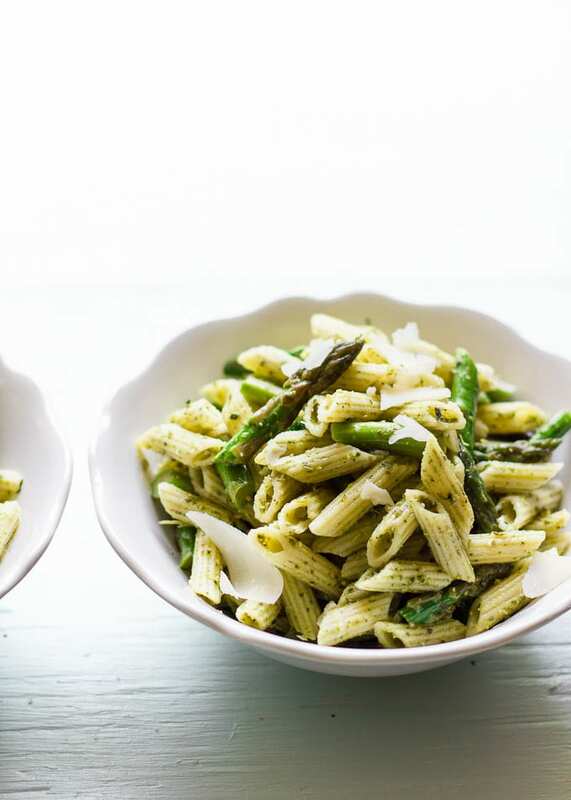 On an angle, cut the asparagus to exactly the same size of your mini penne or other pasta (if using). In a large saute pan, warm a 2 tsp. of olive oil over moderate heat. Add the asparagus and season with salt and pepper. Saute until crisp-tender, about 2- 3 minutes. Any longer and it will lose its bright green color as it will continue to cook once removed from the pan. Transfer to a large serving bowl. When the pasta is ready, add to the bowl. Dollop the pesto over the top and stir well to combine. Add a little bit of the reserved pasta water if the pesto sauce is to thick. Stir well for a smooth, silky texture. Add the crushed red chili flakes and sprinkle with cheese, to taste. Serve warm with a drizzle of olive oil over the top, if desired. Wow this is so fresh and beautiful! I wouldn’t be able to wait to tear into this! Another beautiful recipe. Thanks so much. I can’t imagine not eating a meal because the pasta didn’t match the sauce. Hilarious! I think you need to publish a little guide on here for neophytes like me! I’d love to know specifically what sauce should be served with what pasta shape(s)! Your family must be italian with their commitment to stocking so much pasta and canned tomatoes! Love it! When I’m at the supermarket buying pasta I always have a battle going on in my head as to which pasta to buy to perfectly match the sauce. Your Dad’s pesto recipe looks delicious and one I’d like to try, so yummy.